The glowing parts of the velvet belly lanternshark, as seen from the side. Austin Powers’ Dr. Evil had one simple request: “sharks with frickin’ laser beams attached to their heads.”Velvet belly lantern sharks may not satisfy that demand, but perhaps they’re even better: They come ready-made with glowing spines that look like lightsabers, research shows. These deepwater sharks sport transparent spines, illuminated by a row of light-producing cells along their dorsal fins, according to a study published today (Feb. 21) in the journal Scientific Reports. 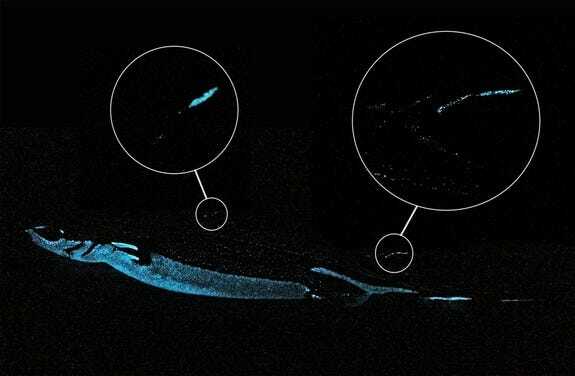 Researchers think the glowing cells help keep these small sharks from being eaten, warning would-be predators that these shark-burgers come with a side of transparent spine that would be tough to swallow. If true, this would the first fish to use light, or bioluminescence, to actively ward off predators, said study author Julien Claes, a researcher at the Catholic University of Louvain in Belgium. Strangely enough, these sharks also have even more glowing cells on the bottom of their bodies, which mimic the light streaming down from above, allowing them to blend in and preventing them from being spotted from creatures below, Claes told OurAmazingPlanet. “This counter-illumination prevents them from casting a shadow,” he said. The sharks live in the eastern Atlantic Ocean and Mediterranean Sea at depths of more than 560 feet (170 meters), Claes said. They usually don’t get longer than about 2 feet (60 centimeters). Using computer models, the researcher found that the light from the “lightsabers” could be seen by predators from a moderate distance, but “could not be used as a lure to attract prey” due to their relative dimness, he said. The sharks likely measure the amount of descending light through their “pineal window,” or “third eye,” a transparent area atop their head, Claes said. The pineal gland then produces hormones, including melatonin, that governs the amount of light produced by the cells on the bottom of their body, allowing them to blend in. Several other species of sharks have defensive spikes, although none of them have been shown to glow, Straube said. It’s also likely the sharks use these light-emitting cells to communicate and recognise one another, Claes added. Reach Douglas Main at [email protected]. Follow him on Twitter @Douglas_Main. Follow OurAmazingPlanet on Twitter @OAPlanet. We’re also on Facebook and Google+.